Redefining workflow from end to end. The new AVC-ULTRA codec family meets every professional user's needs with the favourable image quality and bit rates. This provides major improvements in cost, speed and mobility for all broadcast and image production applications. Significantly reduced operational costs in the workflow of image production. Network-based image acquisition and production by removing constraints on time and place. The provision of an image production environment that inspires the realisation of truly creative image content. An intra-frame compression method that is highly suited to image production. In addition to the enhanced AVC-Intra Class100/50 which supports 1080p*1, AVC-ULTRA includes AVC-Intra Class 200 codec. *1 With superb images that approach uncompressed quality and 24 bit audio, it offers a level of quality that meets the needs of mastering and archiving. 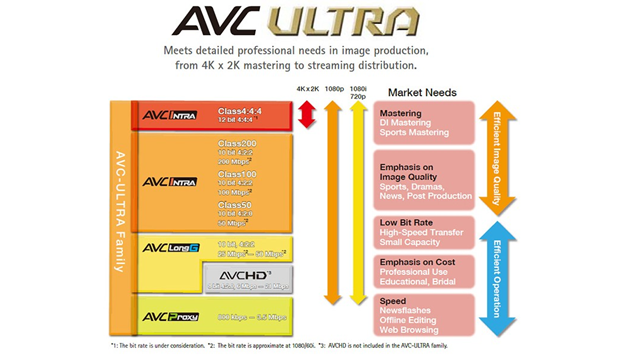 For those needful to work in 4K resolution, AVC-ULTRA offers AVC-Intra Class 4:4:4. An inter-frame compression method that achieves high-quality HD recording at a low bit rate. Ideal for providing on-air content direct from the shooting location and for workflows using content transferred over the internet. Four bit rates are available: AVC-LongG50/25/12*1/6*1 Mbps. For example AVC-LongG25 provides 10 bit/4:2:2 quality at a bit rate of approximately 25 Mbps. Records low-rate, high-resolution, high sound-quality proxy video (Quick Time/H.264) are also recorded with the actual data. *2 Also includes metadata for efficient offline editing. *1: Available in the near future. *2: Proxy data cannot be recorded when using the Loop Rec or Interval Rec function. Proxy data is low-resolution video and audio data with time code, metadata, and other management data in a file format. The use of DCF Technologies is under license from Multi-Format, Inc.